Individuals, families, and communities are achieving optimal quality of life assisted by competent, caring professionals whose expertise is continually updated through AAFCS. To provide leadership and support for professionals whose work assists individuals, families, and communities in making informed decisions about their well being, relationships, and resources to achieve optimal quality of life. Believe in the family as a fundamental unit of society. Embrace diversity and value all people. Support life-long learning and diverse scholarship. Exemplify integrity and ethical behavior. Seek new ideas and initiatives and embrace change. Promote an integrative and holistic approach, aligned with the FCS body of knowledge, to support professionals who work with individuals, families, and communities. Read the AAFCS Code of Ethics for members of the Association. Download our Strategic Direction that includes our three Strategic Priorities and their related goals and desired results. Access all versions of the AAFCS logo and read our graphic standards manual. In 1926, the American Home Economics Association adopted the Betty Lamp as a symbol for the association. The lamp derived its name from the German words "besser" or "bete," meaning "to make better." The Betty Lamp produced comparatively good light for its time and was used widely by early American colonists. Mildred Chamberlain of Chicago submitted the design stating, "The lamp in colonial days provided light for all household industries." Similarly, the American Association of Family & Consumer Sciences (AAFCS) provides enlightenment through leadership in thought and action for family and consumer sciences professionals. The current logo for AAFCS still pays tribute to the Betty Lamp, but in a more contemporary way and includes a person to represent the individuals, families, and communities served by FCS professionals. 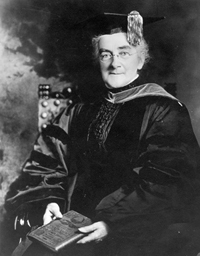 In 1909, Ellen H. Richards, first female graduate and professor at the Massachusetts Institute of Technology, founded the American Home Economics Association (now AAFCS). Ms. Richards was an activist for consumer education, nutrition, child protection, industrial safety, public health, career education, women's rights; purity of air, food, and water, and the application of scientific and management principles to the family. Her professional experience and foresight led to the formalization of the family and consumer sciences profession. Read the AAFCS Brand Story, which provides a brief overview of the Association’s history, purpose, programs, and members. AAFCS is a 501 (c)(3) not-for-profit organization. See our Frequently Asked Questions (FAQs) for additional information on AAFCS and FCS. Read the bylaws governing our Association. Read the policies guiding decisions for our Association.